MANILA — Lumad evacuees from Mindanao, child rights advocates, and other progressives staged a protest in the University of the Philippines (UP) Diliman in Quezon City calling for the lifting of martial law in Mindanao on the third month since President Duterte’s declaration. The “unity walk,” held on Aug. 23, was led by the Save Our Schools Network and Salinlahi Alliance for Children’s Concerns. The groups also called for justice for victims of human rights violations, including Lumads killed by suspected state forces, and those killed in Duterte’s War on Drugs. The groups took off from the UP International Center, marched around the UP Academic Oval, and culminated at the historic AS Steps (Palma Hall) where they held a program. The unity walk also marks the start of the journey of thousands of Moro and indigenous people from Mindanao going to Manila for the Lakbayan ng Bangsamoro at Pambansang Minorya 2017. The delegates will arrive on August 31 and will set up camp in UP Diliman. “As we commemorate the first death anniversary of Danica Garcia, the five-year-old victim of Duterte’s war on drugs, thousands of Lakbayanis from Mindanao and Visayas started their journey to Manila for Lakbayan 2017 as a form of their collective action,” said Eule Rico Bonganay, Salinlahi secretary general. “There’s no safe place under Duterte’s fascist dictatorship, especially for children… These monstrous wars have claimed innocent lives including that of children,” Bonganay said. He added that the government’s counterinsurgency program Oplan Kapayapaan, the extended martial law in Mindanao and military operations in Marawi have worsened extrajudicial killings, forced evacuation, harassment and other human rights violations. 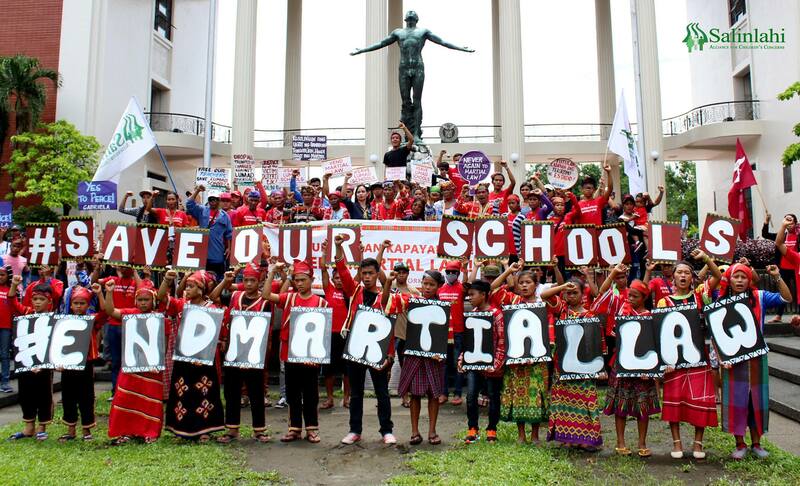 The protesters said since the declaration of martial law in Mindanao, the Armed Forces of the Philippines (AFP) has intensified their justification of the attacks on Lumad schools and communities. Destruction of schools, massive evacuation, harassments, and other human rights violations committed by armed groups under the AFP continue, they said. Rius Valle of the Save Our Schools Network said the Duterte administration’s drug war intensifies extrajudicial killings and the culture of impunity already happening in the government’s so-called War on Terror. “The recent killing of a minor, Kian delos Santos, is reminiscent of the killing of Lumad minors, Emer and Norman Samina, in 2015 by paramilitaries that until now have not been arrested by the police. Guns were planted at the bodies of the two minors to make it look that they were members of the New People’s Army (NPA),” Valle said. 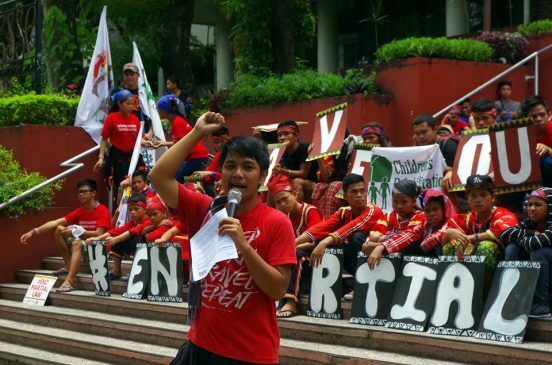 “We call on the people to support and echo our demands to end the Oplan Kapayapaan counter-insurgency program and all fascist policies of the US-Duterte Regime,” said Malayao.